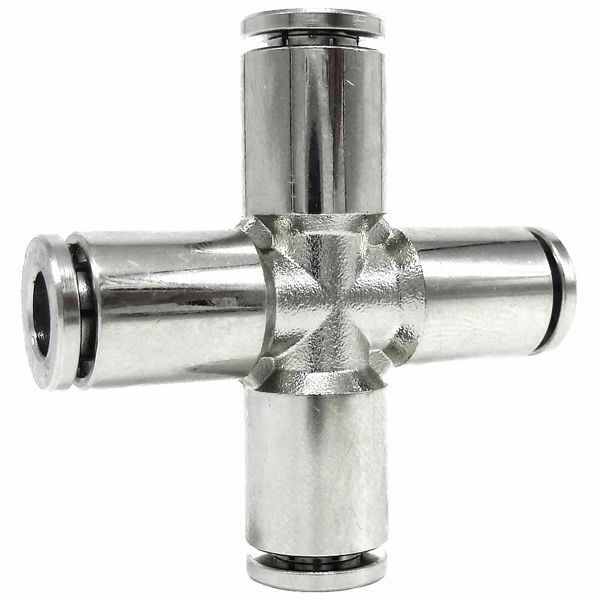 Nickel plated brass push to connect fitting union cross is used to connect four tubes of the same diameter at right angles (cross configuration) for branching fluid distribution. Union cross nickel plated brass pneumatic fitting is popular choice whenever there is a need to split fluid flow into every other direction. Nickel plated brass push to connect fittings are suitable for handling pressures up to 290 PSI. Nickel plated brass fitting union cross is used in pneumatic applications like robotics, conveyor systems and any system requiring the transfer of compressed air or some liquids compatible with the materials of manufacturing. Union cross nickel plated brass pneumatic fittings are available in both inch and metric sizes, and can be used with a variety of tubing materials, compatible with polyethylene, polyurethane, FEP & nylon tubing, the flexible tubing is easily connected by simply inserting the tubing end into the fitting. To release the tubing, press the circular release ring and the tubing can be easily pulled out. In this category you can find metal push-in fittings for hoses with diameter from 4 mm to 16 mm and 1/8" to 1/2".